It’s a temporary entry until I have a chance to put together a full profile. I don’t have enough information for full profile. The character is basically a footnote, but should be listed for completeness’ sake. The character is well-enough known that you already know who he/she is. These are included only to list Flash/Impulse appearances. You can check out my current priorities on the Future Plans page. Also, I did many of these from memory, so there may be some inaccuracies. If you spot one before I do, please let me know. Murderous speedster who took her name from Baron Blitzkrieg, a former Nazi foe of the Justice Society of America. Recruited by Vandal Savage to kill the children and grandshildren of JSA members in hopes of wiping out their lines. 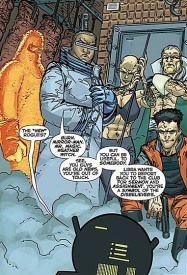 The White Martians A’mon A’mokk and A’morr created a team of five Martian/human hybrids using their own DNA and samples taken from various metahumans, rapidly growing them to adolescence. Among them was a speedster called Blur. His human DNA was likely taken from either Flash Barry Allen or Professor Zoom. The two Martians died in the campaign, but the hybrids survived, fleeing a battle with the Son of Vulcan when he used fire against them. Note: Not to be confused with the Blur from Squadron Supreme. Super-speed mercenary who works with the team Dark Nemesis. Carom has at least some invulnerability, because he can literally bounce off walls without injury. He tends to keep himself in super-speed mode. Notes: The blurring is intentional. Thanks to Brendon Carlson for identifying Carom after I spotted him in the DC Universe Holiday Special 2009. 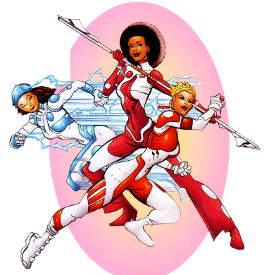 Member of the DNAngels, a trio of super-powered agents created by the U.S. government. Along with Epiphany and Seraph, they were spliced with genetic material taken from Superboy, Impulse and Wonder Girl. Cherub combined DNA from Impulse and Tana Moon, Superboy’s late girlfriend. After an initial clash with Superboy, the trio left government employment and struck out on their own. The Brotherhood of Evil spent years experimenting with cloning technology, hoping to grow the Brain a new body. Along the way, they financed the project by selling clones of metahumans. They created at least one clone of Jay Garrick, the original Flash, and sold the clone to President Ratu Benin, dictator of Mali. Through training or brainwashing, the clone thinks purely in strategy. His tissue is unstable, requiring a special suit to prevent decay. When the Outsiders discovered a huge cache of chemical weapons in Mali, the speedster attempted to take them out. It took the entire team to overpower him, after which he was taken away by Alan Scott and Checkmate. A robot built by “some crank who corresponds with a super-genius in Belle Reve Prison.” It trashed a city street, then was stopped by the Golden-Age Flash, who was filling in for the current Flash. The automaton was never seen again (indeed, it only appeared for one panel), and was presumably deactivated or destroyed. 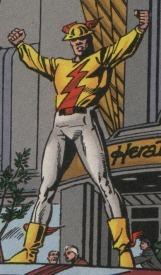 Note: The Rival, Jay Garrick’s opposite number, is also sometimes referred to in fandom as the Golden Age Reverse-Flash. 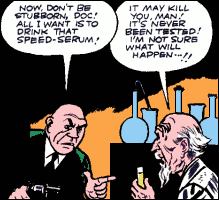 Crook who, fleeing the original Flash, stole a scientist’s untested speed serum, gaining super-speed. The Flash pursued him through time, as they became involved in a number of historical events, eventually visitng both prehistoric times and the distant future. They made a truce to help the last remaining humans escape a dying Earth, then Madden betrayed the Flash to die in the Earth’s molten core. The Flash escaped, and brought Madden back to the 1940s to stand trial. The entire story was told to the Liars Club, and while Jay claimed it was true, he may have been lying. Tag shares a surname with another Golden-Age Flash villain, Eel Madden. It is not known whether they are related. Speedster of the Hyperclan, White Martians who masqueraded as heroes in order to discredit the Justice League and take over the world. Most famous for being punched into orbit by the Flash. Nazi soldier given super-speed by German scientists during World War II. (“Der Zyklon” is German for “the Cyclone.”) His only recorded mission was an attempt with Baron Blitzkrieg to steal the Liberty Bell (which apparently contained mystic energies) and destroy Philadelphia, foiled by Johnny Quick, Liberty Belle, and the original Flash. Here are a few Golden-Age Flash villains who haven’t shown up in the more recent series. Information on the Changeling is entirely second-hand, based on his entry at The Comics Archives. A wraith-like space entity, exploring Earth by merging with various objects and lifeforms, was bored. It came upon aspiring comic-book artist Barney Sands, and found his imagination fascinating. It decided to bring his concept for a “Master Villain” to life, complete with costume and all its powers. The Master Villain was powerful enough to fight the Flash to a stand-still, until he hit upon the idea of imitating the hero Barney had designed to counter the villain. On defeat, the entity decided to leave Earth and explore another planet—one without super-heroes. Nineteenth-century inventor who developed a rocket train which exploded during its test run. His entire family, on hand to watch, was killed, but Keller himself survived (barely), protected by the reinforced cockpit. Keller went insane, and blamed the speedster who would one day call himself Max Mercury for not being there to save his family. He then tracked down those whose lives Max had saved, killing them in “revenge.” After Max jumped forward in time, Keller developed his own time machine, awakening more than a century later to attack Max and his own family. Keller very nearly killed Max and his daughter, an action which would have had profound consequences on the thirtieth century (see Carol Bucklen). Monarch is actually several individuals wearing the same armor. One Monarch was a former hero who would, in the future, take over Earth and rule it as a tyrant. It was this Monarch whose history Waverider hoped to change, as shown in Armageddon 2001 (1991). The conclusion of A2001 led to the transformation of the original Hawk, Hank Hall, into Monarch. (Nothing about this made sense. 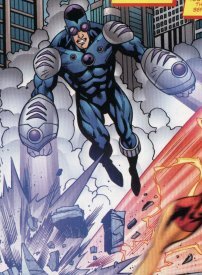 Monarch was originally supposed to be Captain Atom, but the story’s ending leaked, and DC changed it at the last minute, picking a character whose book had been canceled.) This Monarch later absorbed additional powers, calling himself Extant, and manipulated people across time during Zero Hour. He was eventually killed in JSA. During Infinite Crisis, Captain Atom spent some time in the WildStorm universe. 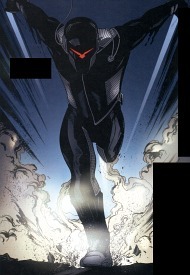 In the ruins of Blüdhaven, he was secretly attacked by the Monitor Solomon, damaging his skin (which holds in the quantum force) and forcing him to be put into the Monarch armor. At first he merely wanted to protect the multiverse from the Monitors, but power corrupted him. He decided to take over himself, built an army of both ordinary soldiers and super-powered beings from across the multiverse, and absorbed the power of all his counterparts from the 52 universes. During the invasion of Earth-51, Monarch was attacked by Superman-Prime. In pitched battle, the Kryptonian ruptured his armor, releasing a wave of quantum energy that destroyed everything in the universe (Countdown to Final Crisis, 2007–2008). Given that Captain Atom has survived similar explosions in the past, this Monarch’s story may not be over yet. This last Monarch put together an arena where he forced recruits—both willing and otherwise—to battle their counterparts from other worlds. The speedsters he selected were the Earth-2 Flash and Earth-9/Tangent Flash, both abductees, and the Earth-3 Johnny Quick, a willing recruit. Johnny Quick won the battle (Countdown Arena #3, 2007) and went on to participate in the invasion of Earth-51. 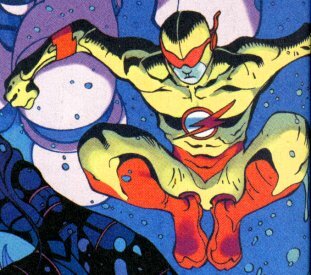 Other speedsters in Monarch’s army included Flash (Linda Park) from a yet-unidentified universe, who participated in actions on Earth-8, and the Nazi Flash of Earth-10. A large-scale black market catering mainly to super-villains, hidden below Keystone City. The Network was run by Blacksmith, with security handled by robotic “Computron” units (no doubt inspired or invented by Colonel Computron), and enforced when necessary by Blacksmith herself. The Network may be the reason so many villains keep returning to Keystone. It’s not clear where it was located during the time Keystone City was held out of phase with the rest of the world. 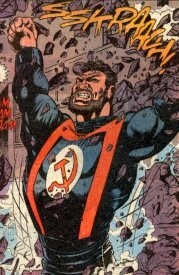 Soviet super-soldier created during World War II, originally Boris Mikhail Dhomov. He resisted the reforms of Glasnost and was imprisoned. Eventually he escaped, went to the United States and attempted to “start a diplomatic incident.” He was stopped by his former countrymen, the Kapitalist Kouriers and Lady Flash as well as the Flash and Pied Piper. One of three elementals summoned by Miles Anton Cramer to manipulate the stock market and make him rich. The IRS sent the Flash after Cramer to collect back taxes. She later showed up as Rudolph West’s date at his ex-wife’s second wedding. Villain who bought super-powers through Lex Luthor’s Everyman Project (see Trajectory). His abilities include firing destructive energy beams. Either his powers weren’t deactivated by LexCorp, or he managed to find a technological replacement. “Impulse” tore up a street in Los Angeles before he was stopped by the fourth Flash—who was rather annoyed that a villain had stolen his old name. Small-time Gotham City criminals who were given the Rogues’ old weapons (confiscated by police, then stolen and sold on the black market) by the Penguin and set up as enforcers. Included: Chill, Burn, Mirror-Man, Mr. Magic, Weather Witch. Eventually sent by Libra to force the original Rogues to join his Secret Society. They beat Paul Gambi within an inch of his life, and captured Captain Cold’s father. Sick of being jerked around, the originals ruthlessly battled the imitators, killing all of them.